We had a very busy day Friday. Lots of helping hands. 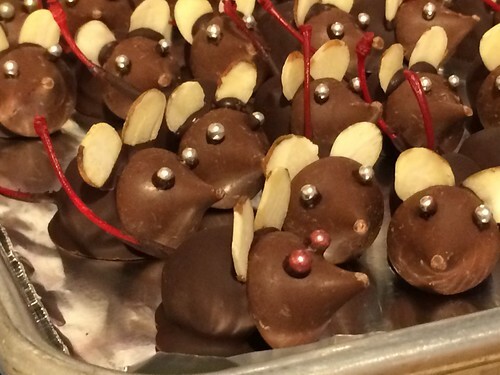 I spent the day in the kitchen, dipping truffles and making a few other goodies. 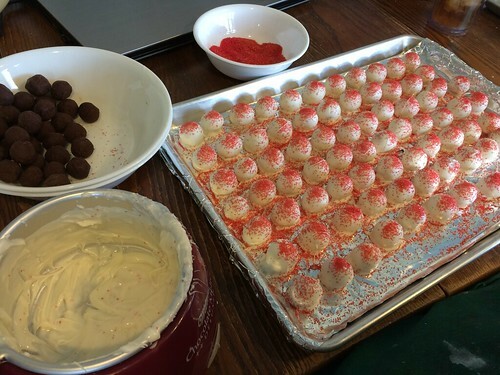 I started with the Raspberry Truffles. Ran out of almond bark and had to send DH to the store for more. 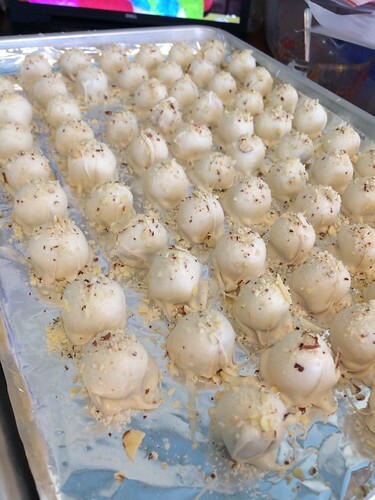 When those were done, I moved on to Almond Truffles. 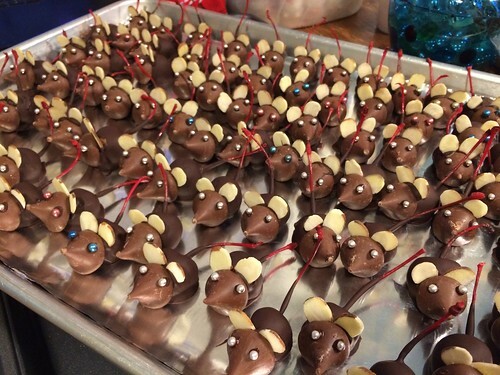 Then I made 80 Christmas Mice. 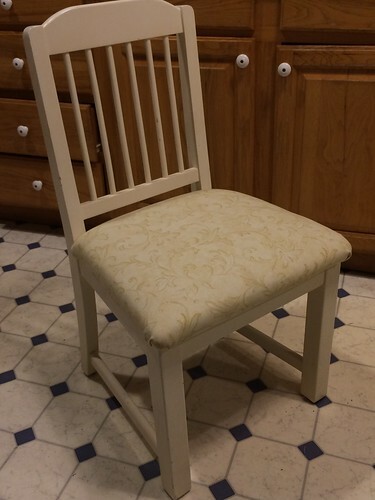 DH and I recovered the seat of this desk chair. Looks so much better now! 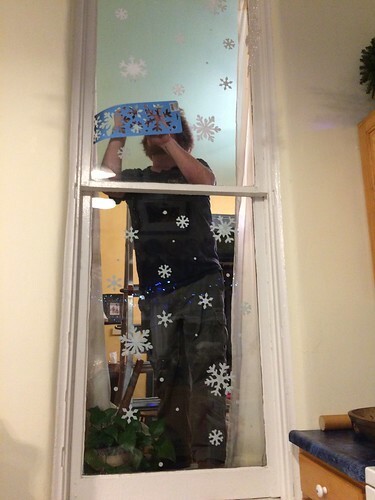 Our dear daughter-in-law stenciled the lower windows with snowflkes. Older Son pitched in to do the upper windows. They used a chalk pen with a stencil and it worked beautifully! 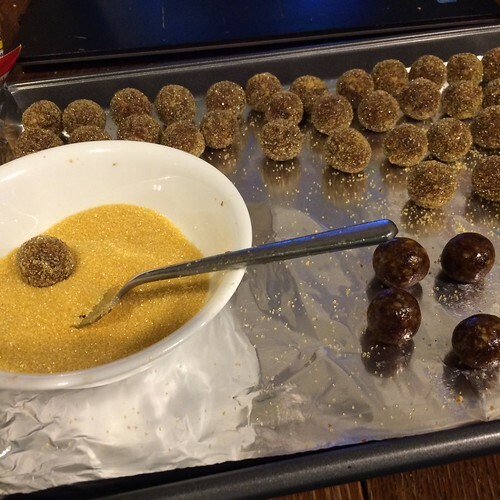 The sugarplums were rolled in gold sanding sugar. 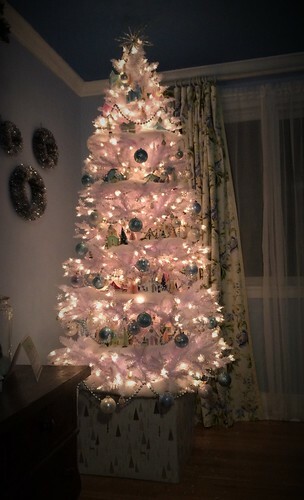 Middle Daughter tweaked the Putz tree for me. It is looking very good! Meanwhile, back in the kitchen, I was making Spiced Pecans and Macadamia Nut Craisin Bark. And all this time, Older Son, our dear Daughter-in-Law and two friends were working away, taking care of all the cleaning. They did a marvelous job! DH took the week off work, as he does every year for the Open House and he has been busy as well. We’re checking things off and it’s coming together! …I wrote the above Friday night and didn’t finish it in time to post. Today (Saturday) I have been SO busy that I have not had time till now…late evening. But we have worked hard, both Friday and Saturday, and we’re almost ready to go. Just a little kitchen clean-up tomorrow morning, a few tweaks here and there and we’ll be done. I’ll quit here and write another post to share a few things from today. 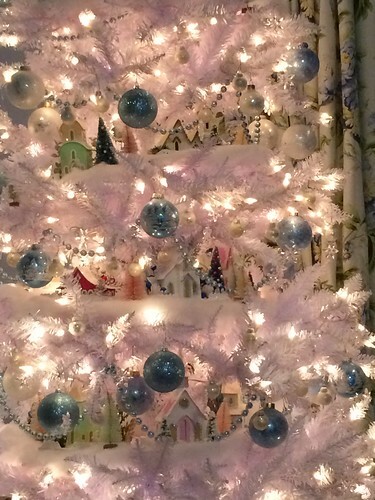 This entry was written by ~~Rhonda, posted on December 3, 2016 at 10:43 pm, filed under Christmas. Bookmark the permalink. Follow any comments here with the RSS feed for this post. Post a comment or leave a trackback: Trackback URL.